The human eye is a spherical structure which fits in the eye socket in the skull bone. There are following main parts in the human eye. 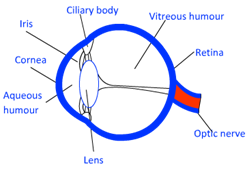 Pupil: Pupil is the round black spot in front of eye. It regulates the amount of light entering the eyes. Pupil works like aperture of a camera. In case of dim light pupil dilate to allow more light to enter the eyes. In case of strong light pupil constrict allowing less light to enter. Irish: Irish is made of muscles. They control the size of opening of pupil. Lens: Lens lies just behind the pupil. Lens becomes thin to increase its focal length. This enables us to see distant objects clearly. To focus on nearer objects, lens becomes thick to decrease its focal length. But there is a limit. The minimum distance of clear vision is 25 cm. Below this distance, we cannot see things clearly. Retina: Retina works like a screen or camera film. Retina is full of light and colour sensitive cells. These cells, upon receiving image send electrical signals to the brain, which processes these information to make a mental image of what we see. The photoreceptor cells in the eye are of two types, viz. rod cells and cone cells. The rod cells are sensitive to dim light. The cone cells are sensitive to bright light and colour. Benefits of two eyes: One eye is having a field of vision of about 150 degrees. Both the eyes enable us to see upto a field of 180 degrees. Moreover, as two different images get juxtaposed in the brain, so we are able to see a three dimensional view of the world. Power of Accommodation of Human Eye: The human eye can clearly see a nearby object as well as an object on infinity. This ability of the human eye is called the power of accommodation of human eye. Cataract: In old age the cornea becomes cloudy. This reduces the vision in old age. Cataract can be cured by eye surgery. Sometimes, artificial lens is also transplanted during cataract surgery. This is called Intra Ocular Lens Transplantation. Correction of Myopia: This defect can be corrected by using a concave lens of suitable power. A concave lens of suitable power will bring the image back on to the retina and thus the defect is corrected. the eyeball has become too small. Correction of Hypermetropia: This defect can be corrected by using a convex lens of appropriate power. Eye-glasses with converging lenses provide the additional focusing power required for forming the image on the retina. Presbyopia: The power of accommodation of the eye usually decreases with ageing. For most people, the near point gradually recedes away. They find it difficult to see nearby objects comfortably and distinctly without corrective eye-glasses. This defect is called Presbyopia. It arises due to the gradual weakening of the ciliary muscles and diminishing flexibility of the eye lens. Sometimes, a person may suffer from both myopia and hypermetropia. Such people often require bifocal lenses. A common type of bi-focal lenses consists of both concave and convex lenses. The upper portion consists of a concave lens. It facilitates distant vision. The lower part is a convex lens. It facilitates near vision.